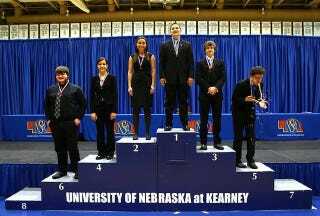 This happened at last week's Nebraska state speech championships, and we are so glad that it did. We don't know the identity of the kid fire-hosing the remnants of his turkey sandwich all over his hands and feet, but we do know that he is a hero. Because of him, we may now enjoy the world's first perfect photo.